Thirteen-year-old Alex Amaro invited his neighbors, Bernard Collins and Faith LeBoeuf, who each live near his house, to the Storybox party. They came — the elders, the youngsters and the in-betweeners — to tell stories, to listen, to reminisce, to mingle, chat and eat. 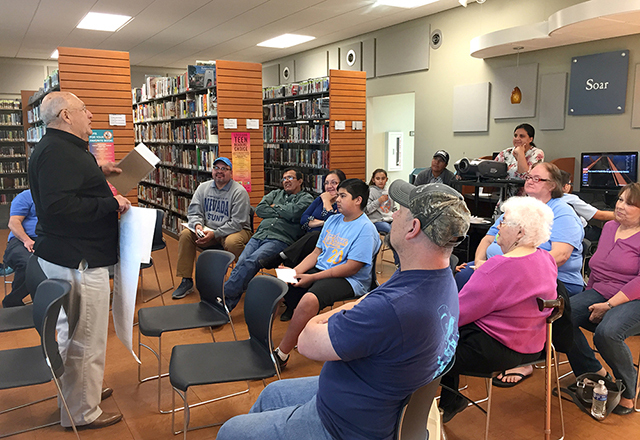 The Storybox party at the Terrebonne Parish Library in Dulac, Louisiana, drew people from across the age spectrum to celebrate the culture and history of their remote bayou town. Storybox, developed by Historypin, is a tool for story sharing and community building. Maddie Shaw embraces her grandmother at the Dulac Library’s Storybox celebration. 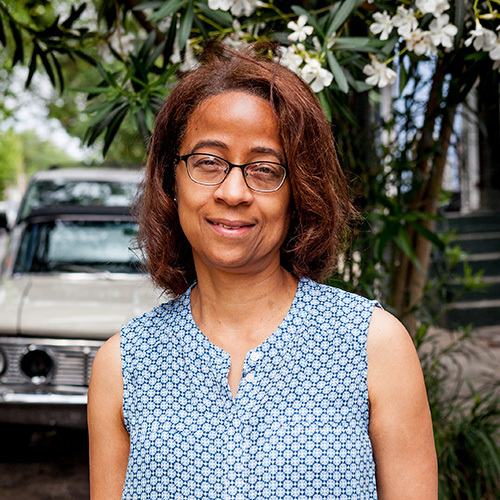 In 2017, Historypin invited the Dulac branch manager, Candace Chauvin, to try out its prototype Storybox program in her community. Chauvin jumped on board because she and library clerk Kelly Boudwin had long wanted to tell the story of their resilient bayou community. In the face of multiple threats — hurricanes, coastal erosion and economic decline among them — Dulac persists, harboring a colorful culture and history. 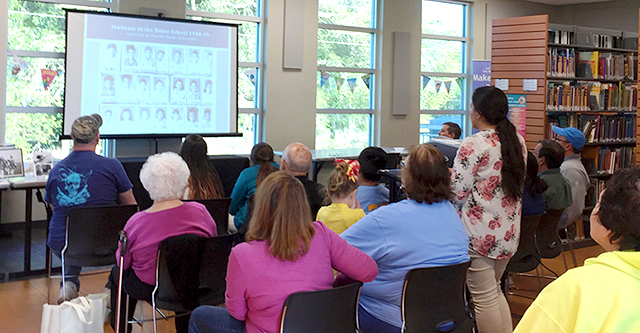 The party, held in March 2018, was the closing event of the Dulac Library’s Storybox pilot program. 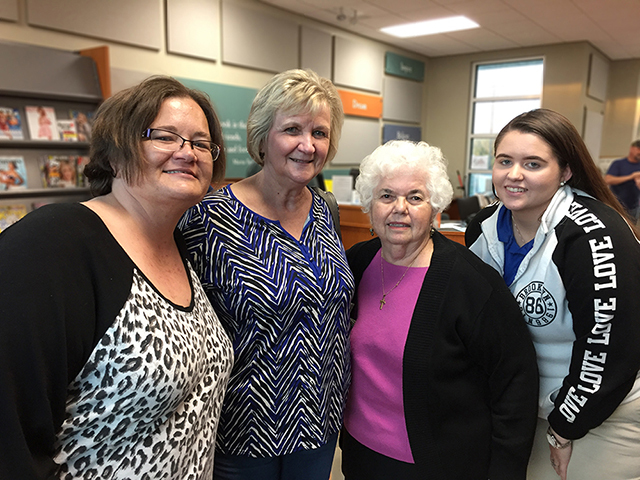 In the weeks leading up to the party, Chauvin invited local residents to the library to donate photographs and share stories about them. She then made a slide show to present at the big gathering. In addition to story starter cards from the Storybox kit, she would use photographs to trigger memories and questions and act as catalysts for storytelling. Plus, sharing the photographs was a fun way to kick off the party. 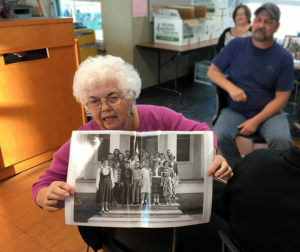 Candace Chauvin kicked off her library’s Storybox celebration with a slide show of historic photographs, including school portraits from long ago. To create a learning opportunity for children — perhaps the library’s biggest constituency — Chauvin wanted to make sure that adults would come prepared to interact with young people. This interaction would help keep Dulac’s story alive by exposing children to first-hand accounts of Dulac’s past. 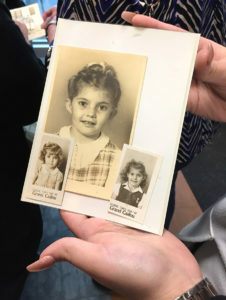 To accomplish this, Chauvin handed out pre-printed invitations to children that they could use to invite adults whose stories they were most curious about. Those adults would have time to think about what they might share with the youngsters about their experiences in Dulac. By all appearances, it worked like a charm. Over the course of the two-hour celebration on a cool, sunny evening, young people from about age 5 to 18 mingled among the grown-ups some of them had invited. Retired school teacher Faith LeBoeuf shares memories about the old days at Dulac’s schools. Thirteen-year-old Alex Amaro invited his elderly neighbors, Bernard Collins and Faith LeBoeuf — Mr. Bernard and Miss Faith, as people here call them. Alex’s mom, Serena Amaro, said her son is helpful to his neighbors, who live on either side of their house. Miss Faith, a retired school teacher, brought hand-written notes to the party, charming the audience with stories about “simpler” times. She recalled when a movie house showed only one movie at a time, milk was delivered to your porch, and schools had no air-conditioning. At one point, she read aloud the relatively low costs of everyday items like bread and milk from a half-century ago. Attendees giggled at the comparatively meager prices. “A Coke was a nickel!” she remembered. Eighteen-year-old Maddie Shaw had rushed to the library from a school sporting event. She didn’t want to miss the celebration. She was joined by her mom and grandmother. “We’ve got three generations here,” Maddie beamed. 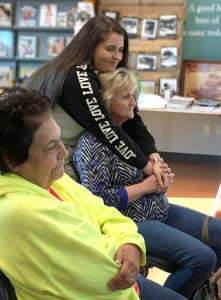 Generations: 18-year-old Maddie Shaw with (left to right) her mother Rhonda Shaw, and grandmother Susan Marcel, along with retired school teacher Faith LeBoeuf. Mr. Bernard, who at one point took center stage at the party, regaled attendees with vivid, detailed, often humorous stories of life in Dulac in the mid-20th century. He accentuated the value of hard work. Bernard Collins addresses attendees at the Dulac public library’s Storybox celebration. All the while, the kids paid close attention, politely asking questions, some they had culled from the Storybox kit. Faith LeBouef’s school portraits from the 1940s. Participants broached tough subjects, but mostly to acknowledge that there was a dark underbelly to some of the sunny, nostalgic themes. Race and ethnicity, as was the case elsewhere in America, historically determined how people were treated in this bayou town. Dulac once was highly segregated, mostly keeping whites separate from Native Americans, who were treated as second-class citizens. Attendees like Miss Faith expressed regret for what she saw as a shameful situation. “When I taught school, I never saw race, I only saw children,” she said. Overall, however, the mood in the cozy one-room library was cheery and upbeat, as attendees laughed and shared memories while they munched on homemade tortillas and spicy salsa, warm roast and rice, “pigs in blankets” and pecan pralines. 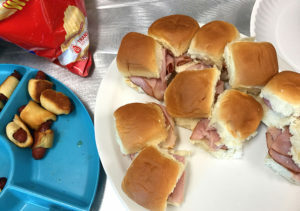 Attendees shared a meal at the party, including ham sandwiches and “pigs in blankets” — sausages wrapped in croissant rolls. 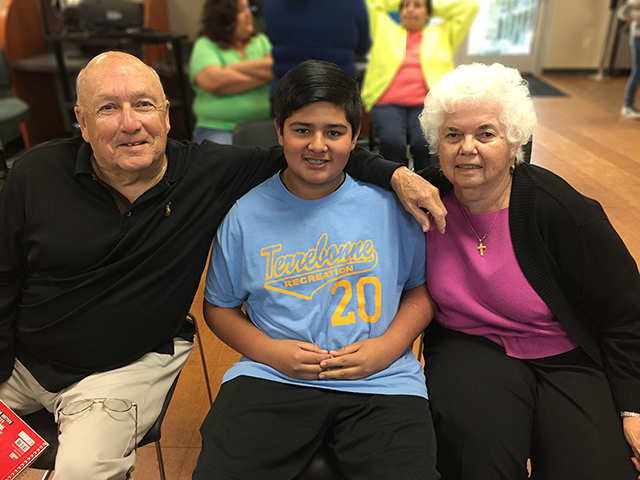 Some were hopeful about Dulac’s future and thankful that the elders took this opportunity to pass on shared values — loving one’s family, respecting others, helping your neighbors — to the community’s children. Children like Alex and others at the party who were willing to participate, ask questions, listen and learn first-hand. Historypin’s Storybox program launches in June 2018 in the US.